Place the onions and olive oil in a large fry pan and simmer until soft. 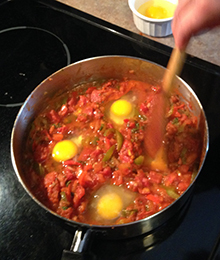 Add bell peppers, garlic, sea salt, paprika, tomato paste, and continue to simmer for several more minutes. Add chopped tomatoes and most of the parsley and continue to cook, uncovered, over low heat until thick, for about 20 more minutes, stirring occasionally. 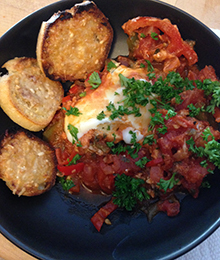 Make 4 holes in the Shakshuka and break an egg into each hole. Cover and continue to cook for about 3 to 4 minutes, until the eggs are set. Serve directly from the pan to the plate. Add remaining parsley to top. Served in photo with toasted garlic sourdough pieces.